Latin America is expected to add around five million pay TV subscribers between 2018 and 2024, bringing the total to 77 million, according to Digital TV Research. 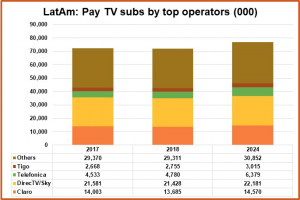 The report estimates that pay TV penetration in the region will not climb beyond the current 44% of TV households and that revenues will fall by 2.1%, some US$381 million, over the forecast period to US$17.82 billion. “Brazil (US$5.57 billion in 2024) will remain the top country for pay TV revenues by some distance, followed by Mexico (US$3.04 billion) and Argentina (US$3.03 billion). However, Brazil’s 2024 total will be lower than 2018 and its peak year of 2014,” according to the research. Brazil lost two million pay TV subscribers between 2014 and 2018 and its peak year of 2014 is not expected to be bettered until 2024. Mexico, which has more pay TV subscribers than Brazil despite having fewer TV homes, has lost subscribers since its peak year of 2016. Amercia Movil and DirecTV/Sky accounted for nearly half of Latin America’s pay TV subscribers by the end of 2018. DirecTV/Sky had 21.43 million subscribers, a figure that is tipped to grow modestly to 22.18 million by 2024. America Movil had 13.69 million subscribers last year – a figure that is down by 890,000 since 2016 and is not expected to return to growth again until 2020. In 2024 its subscriber figure is still expected to be lower than in 2016.